The game engine has been extensively cleaned up to make future work simpler, leading to a small performance improvement. Chain game modes could “forget” they were chain when reloaded. This has now been fixed. The Prime “news item” on the home screen can now be dismissed. This is the first visible part of a wider effort to improve the home screen. Most importantly, a long standing issue that basically prevented the app from running on versions of Android below 4.3. Additionally a crash affecting some people when saving games. Added game “fairness” to the chance-to-win display. Game animation now respects system animation rate value. Most importantly this means animations will be disabled when in battery saver mode. Fixed a hang when in battery saver mode. Fixed an issue with player setup (and potentially other screens) crashing during rotation. Improved layout of the custom game (previously game selection) screen on tablets. 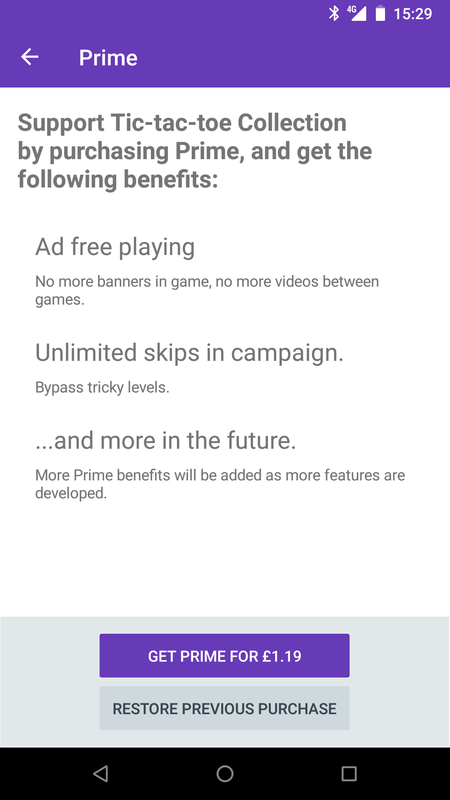 Added Prime, a paid option to disable ads and gain unlimited skips in campaign. You can now save a campaign game as a custom game. 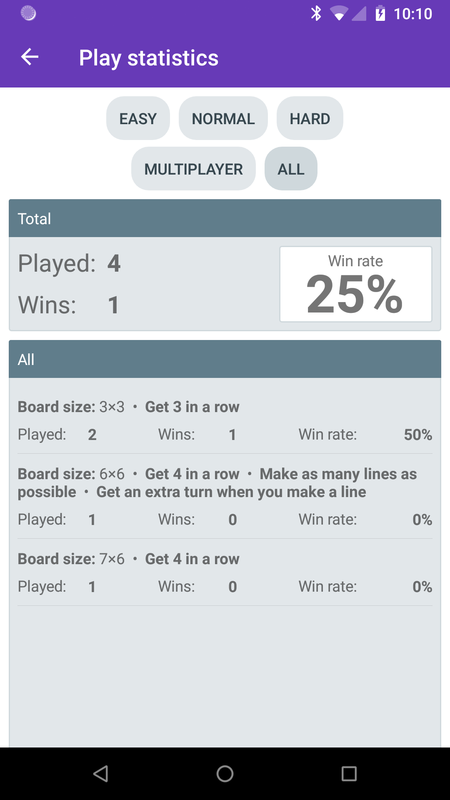 A feature I added after I wanted to save a particularly interesting game of Drop Three to show someone later, and realised I couldn’t. Skipped campaign levels can now be selected. Skipping a level that has already been skipped no longer requires a rewarded ad view. Fixed a progression issue around “free skips” (Gomoku) in campaign mode. Made the human player go first in campaign misère games. Updated the title of “Game select” to “Custom game”.